More than 30 years after the 1979 Convention on the Elimination of All Forms of Discrimination against Women (CEDAW), discrimination on the basis of gender and its consequences for society is still struggling for mainstream attention especially in aquaculture and fisheries. FAO’s 2010/11 flagship report on the State of Food and Agriculture highlighted the gender gap in agriculture and estimated that raising women’s farm productivity by 20-30% could lift 100-150 million people out of poverty. Held as part of the 9th Asian Fisheries and Aquaculture Forum at Shanghai Ocean University from 21 to 23 April 2011, the 3rd Global Symposium on Gender in Aquaculture and Fisheries (GAF3) of the Asian Fisheries Society shone a light on the gender gap in the fish sector. This, the Society’s fifth women/gender symposium, attracted a record number of papers and stimulated lively discussions. It was followed by a FAO Special Workshop on Future Directions for Gender in Aquaculture and Fisheries Action, Research and Development which will be reported on separately. Common themes were revealed: social context needs deeper diagnosis than gender alone in order to understand the complex ‘back stories’; women are still invisible and often marginal in the fish sector, trade and in natural resource management, although mainstream exceptions exist; the conundrum of women’s access to micro-finance yet lack of progress in building assets; and the struggles and successes of achieving gender equality in institutions. Messages of hope also emerged, founded on intrinsic community and personal resilience strategies and innovations such as training and inclusive governance. In opening GAF3, Nandini Gunewardena of FAO urged researchers and agencies to take strategic initiatives to put gender more firmly on the aquaculture and fisheries agenda, especially by building the evidence base, engaging in advocacy and networking to voice issues, focusing on those in which vulnerabilities are strongly gender biased. According to Marilyn Porter, simply adding the gender lens to fisheries research is not enough; social, culture, power and household lenses must also be added. With three examples, she illustrated why researchers need to understand complex ‘back stories’ when helping to improve women’s lives. The examples were: Tanzanian development projects that underachieved because they ignored household economies, the social consequences from the collapse of the Atlantic cod fishery which resulted in the re-structuring of coastal communities in Canada, and the power of shore dealers over boat owners and workers in West Sulawesi, Indonesia. Regardless of whether the aim is to improve women’s position or envision a new more gender equitable society, GAF3 agreed that women lacked profile and recognition in fisheries and aquaculture. To make women’s contributions more visible, Dr B. Shanthi shone a light on 13 particularly successful women aquaculture entrepreneurs of Tamil Nadu, India, showing that women can and do work successfully at all levels. The women included one who manages a freshwater prawn (Macrobrachium) and crab (Scylla serrata) hatchery and five women’s Self Help Groups from the Irrular tribal people raising ornamental fish. These successful cases also give clues as to how more opportunities can be created. Since 1986, the International Collective in Support of Fishworkers (ICSF) has been shining a light on small scale fisher’s contributions. Naina Pierri Estades summarized the 2010 outcomes of a major global ICSF initiative to revitalize the ‘gender agenda’ in small scale fisheries. Based on national and regional studies of gender issues, ‘Recasting the net: defining a gender agenda for sustaining life and livelihoods in fishing communities’ culminated with crystalizing dreams for the future and an agenda for action. The new gender agenda puts women firmly at the center of gender analysis and stresses that small scale fisheries are those in which women are most involved. What theoretical base can researchers use on which to build their analyses and probe the complexity of gendered impacts in the ‘global fish food regime’? Using the recent decades of fisheries development in Kerala State, India, as the context, and case studies of three Kerala women, Holly Hapke proposed a research framework that extends and links commodity chain approaches, such as multi-scaled gendered commodity chain analysis, with household level analysis down to the livelihood and household level. Among the complexities, the case studies revealed some common elements such as migration of husbands for work, diversification of family income sources and combining of family skills to meet the globalization challenges that have shifted Kerala’s forms and loci of fish production and processing. Another conclusion drawn from Dr Hapke’s inquiry into gender theory and analysis in fisheries is the need to understand fish supply chains, including processing and marketing. Who does and controls what in fish processing was the subject of several other GAF3 papers, helping to shine a light on the complexities of gendered divisions of labor and identify suitable entry points for interventions. Della Grace Bacaltos described gender roles in seaweed production and marketing in Davao del Sur, Philippines based on studies by herself, N. Revilla and R. Sordilla. The studies revealed the family-based nature of the farming. Men do most of the site preparation, care, maintenance and harvesting; women and men share the tasks in procuring planting materials and in planting. In marketing, women share the load of negotiating prices and are more likely to receive the family’s money. Industry wide, women take part in all stages, even management, although men take the lead. Moreover, Della Grace Bacaltos also described a Davao region development project that established model farms and an industry clusters to help with value added products and link the farmers, some of whom are former dynamite fishers, to markets. The global supply chain for farmed giant tiger prawn, Penaeus monodon, is one of Asia’s most important and it has been subjected to repeated trade upsets over product quality and production methods. 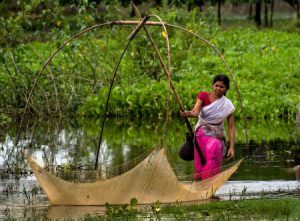 In Bangladesh, Mohammad Nuruzzaman reported how large farms have been fragmented to small holder farms that exported over 50,000 tonnes of giant tiger and freshwater shrimp, and which rely mainly on family labor, including that of women. Farm productivity and profitability are decreasing and, more frequently, export shrimp consignments are failing quality checks. A new project included women in training programs through farmer couples training and in female farmer training. The early experiences revealed what could be improved in family capacity building efforts, such as overcoming initial household resistance to including women and minimizing the dominance of men that can inhibit the women’s classroom learning. In 2004 in Bohol, the Cebu Technological University (CTU) assisted the only Philippine hazard analysis and critical control point (HACCP) shrimp export factory gain certification. Recently, CTU examined the gender side of maintaining HACCP standards. Cecilio S. Baga reported that 80% of the workers were women younger than 30 years who also undertook other work when not processing shrimp which only provides intermittent work depending on harvests. CTU helped train lowly paid, ‘on call’ women and men workers in processing Penaeus monodon (‘pansat’ in Cebuano), opening up job opportunities for potential workers. Despite pride in working in the HACCP plant, however, half the workers wished for better work for their children. Milkfish (Chanos chanos or ‘bangus’) is the Philippine ‘national fish’ yet little is known of the gender contributions to production and processing. Bangus was the focus of CTU’s efforts to revitalize local production and extension by using 55 hectares of its own instructional fish ponds as a test-bed. Venerando D. Cunado reported that, in production, 90% of workers were men, whereas in processing of the product, 68% of workers were women. With the exception of some of the heavier work, however, women and men engaged in the same activities. According to Rosario Segundina Gaerlan, whose participation was supported by FAO-Spain RFLP, in the study done in 8 project sites in Region I (northeast Luzon Island), value can be added to bangus production by enhancing the processing and business skills of women and men in the supply chains. With good management practice, attention to sanitation procedures, plus equipment, capital and know-how backed up by government programs, surplus aquaculture production was turned into household and community profit. Canned tuna may be the most recognized tuna export globally, but, in parts of the Philippines, hot smoked frigate mackerel (Auxis thazard), known as ‘tinap-anan’, is a favorite. In 2005, Corazon. P. Macachor, a food technology researcher, developed methods for monitoring the histamine levels in tinap-anan to ensure food safety during tinap-anan processing, using the new facilities at Danao City fish port. Recently, she examined gender roles in frigate mackerel supply chains and found that both women and men contribute to the safety of tinap-anan. Quality control starts with men’s on-board handling. Women dominate processing and need continued training on safety for tinap-anan and in how to make other value-added products of abundant tuna species. Frequently, projects to assist women focus only on small scale and minor industries within the fish sector. The GAF3 Symposium heard three presentations on gender dimensions in mainstream sectoral industries, namely, carp culture in India, carp polyculture with small Indigenous Fish Species (SIS) and prawn in Nepal and fisheries development projects. “India is basically a carp culture country”, said M.C. Nandheesha and India’s freshwater carp aquaculture was studied in 10 states in the north, east and north-east and south. Women’s participation varied greatly with state, being very low in Andra Pradesh (south) and Punjab (north), both states with large production. Women’s participation was considerable in Manipur, Assam and West Bengal (east and north-east), although largely in pond fertilization, nursery rearing, feeding and harvesting. Self Help Groups (SHG) were often the vehicle for women’s participation. Traditions, cultural differences and economic level of the women appeared to account for the large inter-state differences. Sunila Rai’s work in Nepal presented a different angle on women in carp-SIS-prawn polyculture. In Nepal, carp polyculture is the main aquaculture industry but it does not supply household food. For family consumption, small indigenous fish offer greater nutritional value, as, for example, some have up to two order of magnitude more vitamin A than the carps. Working with the Tharu community of Chitwan, experimental aquaculture demonstrated that, despite water quality problems, polyculture of carp, Macrobrachium and small indigenous fish gave overall higher production without affecting carp production. The women farmers’ ponds with small indigenous species returned 50% more income than those without. The fish were partially harvested over 250 days and households consumed more than half the harvests. Many women are considered marginal and vulnerable in fisheries supply chains but women and vulnerability should not be confounded. However, Ramachandran C Nair’s analysis in India exposed how even success can make women vulnerable in the contested space of Indian marine aquaculture. Across five States, mussel farming and seaweed culture were largely developed as platforms of women’s empowerment, whereas, from the start, open-sea cage culture is masculine in its conduct. Once women’s mussel and seaweed farming became profitable through State support, banks joined and the industries seem headed towards male dominated coastal privatization, led by the more mature mussel farming for which common property rights are becoming defined. The women-dominated industries started out without any common property rights, whereas cage culture has these from the start. The States, which earlier promoted women’s development at the community and household level, are silent on the contest for capital and coastal space rights. For poor households, microfinance has become a popular though increasingly questioned solution. It is often targeted at women even if the gender dimensions are rarely studied. Two presentations at GAF3 showed that microfinance, while well regarded by the recipients, usually does not increase their assets and productivity. In 2 districts of Kerala, India, Nikita Gopal reported that government and non-government run microfinance schemes had helped family finances and improved household financial decision-making in low-income families but, since most of the funds had gone into meeting household expenses and not into entrepreneurial opportunities, asset creation had been minimal. In Guimaras, Philippines, Alice J. G. Ferrer found similar results when she studied women and men in fishing and non-fishing households. The decision to seek credit was typically taken jointly by the wife and husband but women then sought the majority of credit, mainly from informal sources. The credit, however, fed consumption rather than production and hence failed to improve productivity or living standards. Both studies stressed the importance of examining all sources of credit and better understanding the need for credit. Women sea divers in Japan and Korea have been long a source of wonder but the reality of their way of life has been little understood. In Japan’s southwest Iki Island, Nagasaki Prefecture, most ‘ama’ or sea people divers are women and more than half of them in the study presented by Cristina P. Lim were already in their 50s. While having formal rights to harvest sedentary species such as abalone and sea urchin, the ama earnings are declining, and their overall fishing rights and access to decision-making in the fisheries cooperative associations are secondary to those of the men. In contrast to Japan where men still dive, in Korea, only women now dive. As in Japan, the divers are an aging group. Sun-Ae Ii traced the history of Korean women divers, many of whom are in the south and originated over 100 years ago from Jeju Island. Despite their ecosystem knowledge, household and community contributions, the women divers are marginalized on account of: their gender, that their fishing is inshore, targets only sedentary species and they come not from peninsular Korea but from Jeju Island. The needs of the women divers are not addressed in fisheries policies and assistance. Newcomers to a community often suffer the marginalization of being outsiders. In Taiwan, however, where the rate of marriage with foreigners is currently about 15%, Nai-Hsien Chao found in five fishing villages that foreign spouses, predominately from China and Vietnam, tended to be self-motivated, hard working and well integrated into society. Of the interviewees, 70% contributed all their earnings, much also from the aquaculture and fisheries sector, to family expenses. Fishers and fishing communities are still vulnerable to poverty, even in fast modernizing economies such as Malaysia, from which four GAF3 presentations examined poverty, aging and gender perspectives. Jariah Masud’s work analysed Malaysian national poverty eradication programs which, despite their considerable achievements and the growth of the fisheries and aquaculture sector, had not changed the endemic poverty in fishing communities. As women’s roles in fisheries are invisible, special fisheries programs never targeted women even where women contribute as fishers, such as on Bruit Island, Sarawak. Likewise, women-only poverty eradication programs were outside the economic mainstream, focusing mainly on the perceived social problems of poverty. Assumptions and practices with respect to gender, poverty and fisheries need to be rethought and based on better understanding of poverty among fishing households. In another presentation, Jariah Masud explored the constraints faced by fishing community women in becoming entrepreneurial and graduating from survival to high income status from fish related and other enterprises. Several rural Malaysian women have succeeded in redesigning their businesses to become more productive and profitable but further study is needed to better understand what factors contribute to success, including how to best use or even avoid credit. Tengku Aizan Hamid’s detailed analysis of the demographics of Malaysia’s fishing population showed an aging trend, although in Sabah and Sarawak, foreign labor is causing ‘younging’ of the fishing population. On average, traditional fishers are older than commercial fishers. Statistics on women’s employment may not be reliable and need improvement before reliable patterns can be identified. National fisheries development policies seek to revolutionize the sector through subsidies, injection of equipment and infrastructure but these interventions do not reflect the realities of the skills available nor address the need for human capacity development that would be needed. To stimulate GAF3 inputs to its design, Zumilah Zainalaludin presented draft plans for a regional workshop on empowering vulnerable stakeholder groups in fish farming that is part of the European Union funded ASEM Aquaculture Platform. The critical point will be who to target in order to stimulate mindsets on gender in aquaculture. In two coastal cities of Central Java, Semarang (a large city) and Pekalongan (a small city), Indonesia, Zuzy Anna used rapid quantitative appraisal (rapfish) analysis on ecological, economic, social and institutional uncertainties facing two groups of women – wives of traditional fishermen and wives of non-fishermen but engaged in fishing-related activities. The areas studied have among the highest divorce rates in Indonesia. Fishers’ wives near Pekalongan tended to experience the least uncertainty and those near Semarang the most. Non-fishers’ wives experienced less seasonal effect than the fishers’ wives. The most important drivers for the different dimensions of uncertainty were: ecological – drought, pollution and season; economic – volatility in production and income; social – family instability, unemployment and health; and institutional – dependency on credit and savings and local financiers. The women used many different strategies to cope with fishing and non-fishing uncertainties, such as reigning in spending and taking up piece-work outside the home. Personal and cultural attitudes also played their part, including a ‘life goes on’ outlook. Although satisfying the national criteria for classification of fishers, women in the remote Pantar islands of East Nusa Tenggara, Indonesia are less regarded than men as marine resource users. Using participatory rural appraisal and focus groups discussions, Ria Fitriana thoroughly documented the women’s and men’s fishing related activities, throughout the supply chain, revealing a great range of overlaps and complementarities in fisheries activities. In coastal Sri Lanka, the poor fishing village of Naguleliya is heavily dependent on fishing, C.D.A.M.P.A.Dissanayake found increasing dependence on women’s fishing by hand or helping in seasonal beach seining, especially in households supported by widows or where husbands were unemployed. The central coastal region of Vietnam also presents challenges, especially to women, dependent on fisheries resources, according to Nguyen Dang Hao who, under the FAO-Spain RFLP studied 16 communes in the provinces of Quang Tri, Thua Thien Hue and Quang Nam. Here, on average, women bear more children than the national average and work 12 to 14 hour days, 3-4 hours longer than the men. People in these poor provinces suffer from low education levels, combined with escalating fishing pressure on open access resources under sometimes dangerous and risky conditions, such as hurricanes. These handicaps mean that women, although having access to credit, know little about financial management and have almost no voice in managing the natural resources due to the prejudices of traditional beliefs. Women generally have fewer money earning opportunities than men except in raising livestock and trading fish. Although women and men have high participation rates in the Women’s Union and Farmer’s Association, respectively, these bodies offer little more than the sympathetic support and the opportunity to share experiences. “Edging up the ladder” was how Cristina P. Lim characterized the progress of most women in Ban Thung Maha, a Thai-Buddhist village on the Andaman Sea coast of Thailand. Women undertook a wider range of complementary fisheries, coconut, rubber and palm oil plantation and household tasks than the men but held little in terms of formal fishing rights and positions in local institutions. Case studies showed five women forging their own and joint family income opportunities to survive but some did not even dare to dream of a better life. Aquaculture and fisheries may be especially important to households affected by natural calamities and heavy disease burdens. In Namibia, Africa, the need to find food and income producing opportunities for women affected by HIV/AIDS resulted in the Mangulukeni Fish Farm project. According to the results presented by Gosbert Hamutenya and facilitated by Kibria Ghulam, the first harvest of tilapia had been poor due to an unexpected flood that shortened the growing season but women still felt empowered by the farming experience. GAF3 participants offered suggestions for building on the early sense of empowerment experienced by the women by improving future harvests included assistance through special project funding and greater technical assistance to diagnose the productivity problems. In the 2004 Indian Ocean tsunami, 189 people, 150 of whom were women, were killed in Thotamuna village, Sri Lanka. Yet, today, women outnumber men by more than two to one. Fish are the main source of income and yet most local fish, caught by the men, bypasses local women and goes, via wholesalers, processors and exporters to national and international markets, according to the work of Bandara Basnayake whose participation in the Symposium was made possible by the RFLP. A detailed and gendered analysis of the causes and effects of poor growth in micro-enterprises has indicated that local gender relationships offer an untapped potential for gradually building the amount of fish processed first by local women with the skills enhanced to provide products to meet different market demands. Such efforts, if they could gradually break the existing trade cycle, could lift households out of poverty and further strengthen gender relations. Pacific island case studies from Melanesia (Fiji, Solomon Islands), Polynesia (Niue, Samoa) and Micronesia (Federated States of Micronesia) illuminated, albeit with some variations, the dominance of women in inshore, reef and lagoon fisheries and fish marketing. Young people are also major users of the coastal zone and therefore also impacted by climate effects such as sea level rise and greater salt intrusions to coastal gardens. Although market savvy, women were not very knowledgeable on climate change and its impacts, even though the coastal locus of their work and the use of traditional fishing methods make them keen observers of the environment. While not underestimating the cultural shift required, Veikila Vuki concluded that women, young people and institutions which included them should urgently be brought into climate change decision making so that society could understand their needs and make use of their special insights. At Barangay Bislig, Leyte, Philippines, a fishing dependent village with many migrant families, Marieta Bañez Sumagaysay found that most but not all women fish driers were aware of climate change through local signals such as prolonged rain and unpredictable weather. The impacts on fish drying, already challenged due to declining fish availability, were to increase the women’s labor, the costs for additional salt and the losses from spoilage, all leading to lower income. Given limited livelihood alternatives, the women are adapting by paying more attention to weather forecasts, and adjusting their drying practices and technologies to copy with the new irregular rainfall patterns. For these women, more long term and lasting solutions will need greater technology changes and development of more livelihood options beyond fish drying. Mangrove destruction has been serious in most tropical countries, not least the Philippines where efforts to reforest coastal sites have met with mixed success. In two presentations, Farisal U. Bagsit and Alice Joan Ferrer delved into gender roles and responsibilities in mangrove reforestation programs in the Western Visayas, Philippines. The studies examined different types of institutions involved in reforestation, namely a 14 year old concerned citizens association (F. Bagsit) and six people’s organizations formed or recently strengthened in a three year old project led by a United Kingdom Based non-government organization, the Zoological Society of London (A. Ferrer). In both studies, women tended to remain active longer than the men in people’s organizations and undertook a greater range of roles in the mangrove replanting and nursery activities. Where gender comparisons were possible, men tended to take on more leadership positions and tasks requiring greater physical strength, but women performed many different roles and substituted for husbands when they were not available. In Farisal Bagsit’s study, the women earned low incomes from their other activities and valued the small additional income from sales of mangrove seedlings and propagules. Despite the onerous work that takes people from other duties and jobs, both studies revealed an appreciation of the importance of reforestation and the shared camaraderie of the work. Gender is an important dimension in human institutions. In fisheries, this dimension is often ignored or, worse, women frequently are not given access to membership or rights. Even when gender is ignored, such as in education institutions, wider social changes are altering the gender ratios in aquaculture and fisheries institutions. Rather than awaiting slow, passive, externally driven change, actors have taken to activism and advocacy. Over the last decade, successful activism by representatives of fisher’s wives, fishing women’s organizations and feminist academics in Europe has yielded major steps forward in formal standing and rights of women, e.g., achieving 2010 EU Directive 2010/41 on spouse rights. Katia Frangoudes, from the frontline experience of academic research and activism in AKTEA, the European women’s organization, described how the European Union (EU) rather than national governments has demonstrated political willingness. The movement has observed that women activists have been critical to the achievements, and also that it cannot rely on women parliamentary leaders to advocate for women. In 2006 in Cambodia, where late 20th century wars reduced cohorts of men even more than those of women, the Ministry of Agriculture, Forestry and Fisheries developed and now, through the Fisheries Administration, is implementing a gender mainstreaming policy and strategy in the fish sector. Heng Ponley, whose participation was made possible by the RFLP, stressed that, despite gender being a controversial and complex subject, and with limited resources and information on gender roles in fisheries, the policy and strategy had made encouraging progress in raising awareness and mainstreaming gender in the central Fisheries Administration. This is the vital first step to eventually achieve gender equality in the sector. As in many scientific fields, the aquaculture and fisheries career pipeline from education to research ‘leaks’ women at a greater rate than men and women’s career progress generally ends in lower salaries and less senior positions. This is despite equal opportunities, reported Hillary Egna, using data from nearly 30 years of work by the USAid funded Cooperative Research Support Programs (CRSP) for aquaculture. Women represented about half the graduates in recent years; in 1999 an upward inflection occurred after earlier lower rates. Although the CRSP’s director and principal investigator is a women (Hillary herself), the numbers of women leaders and researchers are low (12-25%) and active efforts are being used to understand and break through the persistent career barriers and use the full potential of the women graduates. Stella Williams stressed that world development had ignored women for nearly 50 years, including in the field as farmers and fishers and in science, education and research. African agricultural education and R&D statistics showed the typical ‘leaky pipeline’ with fewer women in higher positions. Stella shared her personal experience in aquaculture education, research and development and recent lessons from the African Women in Agricultural Research and Development (AWARD) program which is now engendering the African agricultural R&D through post-bachelors, masters and doctoral fellowships, mentoring, networking and role modeling. Science and leadership skills are targeted in the fellowship holders from the 10 AWARD countries. Based on a survey of over 600 people in five coastal municipalities of Southern Iloilo on Panay Island, Philippines, Caridad N. Jimenez reported on views of gender in fisheries law dissemination and enforcement. Gender was not a major issue among the fishing communities, although women and men are perceived to have different strengths. Legal material was not regarded as gender biased and women were seen as better than men at disseminating the materials. Two thirds of people had no preference on the gender of extension workers, and 95% thought that the gender of an enforcement officer was not an issue. Women were well regarded as effective in fisheries intelligence and surveillance. As expected, concerns were expressed at the idea of women having to deal with troublesome fishers, travel far from home and go to sea. The poster by SijieXu on women’s roles in China’s new fishing villages, inland and coastal, highlighted the critical roles and opportunities of women, who make up about 60% of the labor force, carry a substantial share of the work but have not yet taken full advantage of opportunities in China’s new economic era. Mundus Maris – Sciences and Arts for Sustainability – exhibited three outstanding posters, primarily on people in aquaculture. ‘A mosaic of people’ presented the range of women’s and men’s roles aquatic farming on the different continents; ‘Rapid aquaculture expansion and continued change’ addressed the human capital challenges of aquaculture’s rapid expansion; and ‘Making the rules work for people’ stressed social and environmental justice. Zumilah Zainalaludin found high levels of poverty in both able-bodied and vulnerable Malaysian fishing households but households with higher ratios of women tended to be most affected. G. Arul Oli and colleagues’ poster stressed the importance of fisheries in India, the lack of attention to gender and outlined well advanced plans for a non-credit certificate course on ‘Gender in Aquaculture and Fisheries’ for Indian Fisheries Colleges and research institutes. GAF3 (http://www.genderaquafish.org/) was supported by the Asian Fisheries Society, the Food and Agriculture Organization (FAO), the National Network on Women in Fisheries in the Philippines, Inc., the FAO-Spain Regional Fisheries Livelihood Programme for South and Southeast Asia, the Indian Council of Agricultural Research, Shanghai Ocean University and Mundus Maris plus the personal support of all presenters and their organizations. It was held as part of the 9th Asian Fisheries and Aquaculture Forum hosted by Shanghai Ocean University, Shanghai, China, from 21-23 April 2011. All supporters are gratefully acknowledged. GAF3 was the 5th women/gender in fisheries/aquaculture symposium in the series hosted by the Asian Fisheries Society (AFS, www.asianfisheriessociety.org) over the past 13 years. Founded in 1984, AFS is a non-profit scientific society that promotes networking and co-operation between scientists, technicians and all stakeholders involved in fisheries (including aquaculture) production, research and development in Asia. Its ultimate objective is to enhance food security and income-generating opportunities for fisheries workers via sound management practices, environmentally sustainable development and efficient utilisation of the aquatic resources. At GAF3, 48 papers were presented, 41 oral papers and 7 posters, as well as a discussion session in preparation for the FAO Special Workshop that followed GAF3. Presentations and posters covered the following geographic areas: global – 9 presentations; countries – Asia: Bangladesh, Cambodia, China, India, Indonesia, Japan, Korea, Malaysia, Nepal, Philippines, Sri Lanka, Taiwan, Thailand, Vietnam; Africa: Namibia, Tanzania; regions; South and Southeast Asia, Pacific, Europe. Presenters came from 21 countries. On 23-24 April 2011, FAO convened a Special Workshop on “Future Directions for Gender in Aquaculture and Fisheries Action, Research and Development”. FAO will report on the outcomes of this Special Workshop elsewhere and notice of outputs will be posted on http://www.genderaquafish.org/.